Matthews Painting Company has been pressure washing, staining and sealing decks since we started our deck staining and sealing business over 20 years ago. We stain and seal decks in the Warsaw, Winona Lake, Leesburg, Syracuse, Goshen, Columbia City, Lake Wawasee, Lake Tippecanoe and North Webster Indiana areas. Whether the deck is wood, composite, or vinyl, all deck surfaces exposed to the sun and rain need to be periodically maintained by cleaning, staining, or sealing to prevent gray UV damage, mold, mildew, algae, oxidation, fading, splitting, and rot. Our deck staining firm has received certification through Cabot and Sikkens Stain Companies. 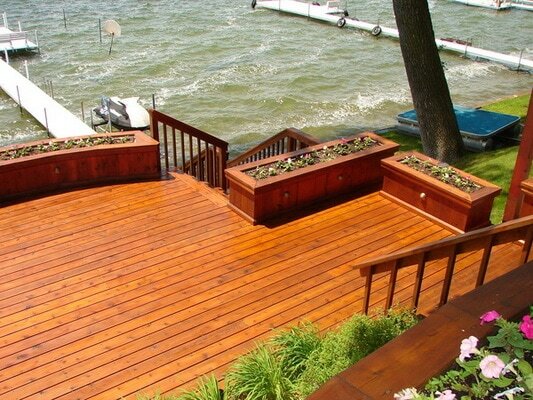 We are your Warsaw and Syracuse Certified Wood Care Specialists for your deck staining or sealing needs. Whether the deck is new or old, we apply a deck cleaning solution to the wood surfaces to break up dirt and kill any mold, mildew, or algae that may be present. We then pressure wash the deck surfaces to open up mill glaze(planer crush) on new wood, remove most of the UV damage on weathered wood, and clean the wood. After the deck is dry, we then recommend 1 coat of a tinted translucent stain or sealer to be applied by a brush and roller, which will protect the deck surfaces from moisture and the sun’s harmful UV rays. Wood decks with a semi-transparent coating should be pressure washed, stained, and sealed every 2-3 years. If your deck has solid stain or paint on it, we recommend adding scraping and sanding, then applying 2 coats of a porch paint or solid deck stain by a brush and roller. Wood decks with a solid stain or paint on them should be maintained every 3-5 years. We apply a composite deck cleaning solution and strong mildewcide to break down dirt and kill mold, mildew, and algae. We then pressure wash the composite deck to clean the surface and remove contaminants. Either an application of Trex approved post mold and mildew inhibiting solution is applied to the composite deck surfaces to inhibit future growth or composite decks can actually receive 1 coat of a translucent stain or 2 coats of a solid stain, specifically tested and approved for composite decking. Both products we have used with great success. Composite decks should be pressure washed and maintained every 2-3 years. Not only do vinyl decks show dirt, mold, mildew, and algae the most, they also fade and oxidize(chalk) just like vinyl siding on a home. We apply a vinyl deck cleaning solution to the deck surfaces to kill mold, mildew, and algae and break down dirt and foreign material. We then pressure wash the vinyl deck to clean the surface and remove most of the chalky oxidation. A post mold and mildew inhibiting solution is applied to the vinyl deck surfaces after the pressure washing is complete to inhibit mildew, mold, and algae. Vinyl decks should be pressure washed and maintained every 2-3 years or less if desired. Exclusive to Matthews’ Painting, we moisture test your wood deck, spindles, and railing using our self calibrated moisture tester to make sure the moisture content in the wood deck is near 15% or under before any staining or sealing on your deck is performed. Studies have shown that the number one cause Deck Staining for failure of any stain or sealer on a wood deck is a moisture content in the wood exceeding well above 15%. Many new deck owners have been told to allow their wood deck to weather for 1 year before staining or sealing it. This simply is not true. The wood on your deck should never be allowed to turn gray. Gray wood on your deck is the result of the sun breaking down the natural glue in the wood called lignin. Waiting 1 year to seal or stain your deck may allow the splitting or warping process of the unsealed deck to start. Pressure washing, staining and sealing your wood deck will help prevent this from happening. Are you undecided on which color to stain your deck? How about that composite or vinyl deck? Maintenance free, right? No! I am sure you have noticed by now that the deck color has lightened and that black mildew, mold, or green algae have taken over the deck which in turn results in a slippery, unsightly deck. Call 574-834-3575 for a free deck staining and sealing quote or deck color consultation.